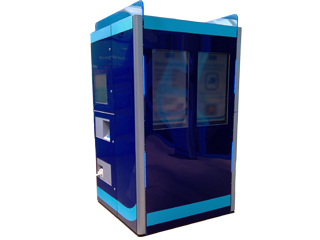 Our second Robotic Kiosk, with 4 usable sides, which adds exciting extended functionality to our range. The I-Touch Totem 2 DXL has a robotic carousel installed and four usable sides, making it capable of many complicated automation tasks and is truly multi-fuctional. It is able to store, hold and dispense a wide range of items. This multi-tasking, multi-purpose unit is equipped with two user interactable sides, one staff loading side and the final, fourth side, can be used as advertising/instruction information. The I-Touch Totem 2 DXL has great presence and extreme fleixibility in functionality. This, when coupled with the automated carousel, means that this unit is suitable for a vast range of applications.